Okay, so here in Canada, Thanksgiving has come and gone. Our fall feast comes before Halloween, which means most of the turkey leftovers have disappeared. There is one big advantage to having Canadian Thanksgiving before the American holiday. If for whatever reason we miss getting together with our family or friends, we simply catch up a few weeks later, choosing to give thanks to the earth again in November as our neighbours to the south do. For some reason, this happens almost every year. At our house, belated Thanksgiving wouldn’t be the same without Aunty Andy and her homemade Maple Apple Sauce. The original recipe was from Canada’s very own Chatelaine magazine. Auntie has adapted it over the years, whipping it into its current perfection. Serve it with a little ice cream or granola and you’ve got yourself the perfect Thanksgiving dessert, breakfast, or post turkey snack. Print this recipe and keep it close to the stuffing one you always look for. Prepare apples. Chop into small pieces. Melt butter in large pot. Place on medium heat. Add apples and all other ingredients. Reduce to low and cook for about 45 minutes. Stir often to make sure apples are not burning. Serve warm or cold. Extras can be refrigerated for four days or frozen. Note: If you have picky kids like me, you may want to mash the apples to make sure there are no chunks. The most important thing to remember about this recipe is that you core the apples properly. Any seed casings left in accidentally and you’ve got choking hazards and people picking food out of their mouths as they eat. This recipe makes a double batch. 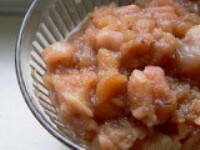 Hope all enjoy this delish twist on traditional apple sauce. I’m sure there is none left at the Benwell household! You’re right. I stashed the last bowl at the back of the fridge and indulged myself yesterday when no one else was looking!